Parents plan to spend a lot less this year on back-to-school essentials like backpacks, clothes and school supplies, a recent survey finds. The survey, conducted by the National Retail Federation, showed that 85 percent of people expect to rein in their back-to-school spending during these tough economic times. The average family will spend just under $550, a 7.7 percent drop compared to last year. And while college students are expected to spend an average of about $618—up 3 percent from 2008—total college spending will likely drop 7 percent as fewer people attend college in the fall. Overall, shoppers are expected to spend $17.4 billion, a 13 percent decline compared to last year, according to news reports. "The economy has clearly changed the spending habits of American families, which will likely create a difficult back-to-school season for retailers," says Tracy Mullin, president of the NRF. According to the survey, 56 percent of respondents are looking for sales and about 49 percent said they will simply spend less this fall. 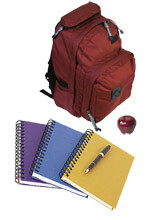 Shoppers are also looking to retail alternatives such as drug and thrift stores to buy school supplies, reports say. About 22 percent will look online for bargains. The back-to-school season is the second busiest for retailers behind the holidays—and retailers often use it to identify possible holiday trends, the NRF notes. Retailers have already seen a 4.9 percent sales decline during June—marking the 10th month in a row sales have fallen. "Retail has been dealt a big blow, but they've gotten good at this," George Whalin, president of Retail Management Consultants, tells CNN. "They're prepared for down months, so we don't see the piles of supply that we saw a few years ago. Consumers need to get in and buy before it's gone." Even so, some shoppers said they will wait until the school year begins to buy goods—and hopefully take advantage of clearance prices. "As people focus primarily on price, strong promotions and deep discounts will ultimately win over the back-to-school shoppers this year," Mullin notes. Tap into the needs and wants of students and nostalgists, alike.